Congratulations to my first ever client, Rubywaxx! If you’ve ever had a marketing consultation or a coffee with me, you might have heard my favourite (true) story. And that story is about me still working with my first ever marketing consulting client. Rubywaxx now has 3 beauty salons – with a 4th opening next week – and a team of 10+ beauty therapists. 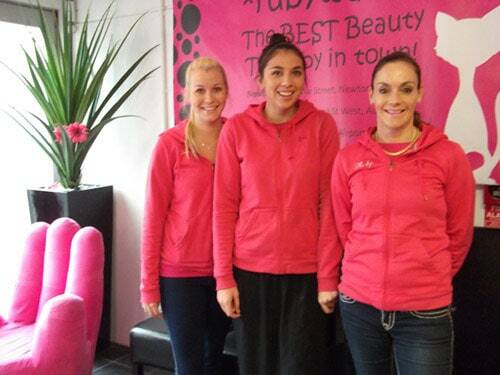 Some of the Rubywaxx team: business owner Ruby Francis (right) with two of the beauty therapists. Best of all, I’m still working with Rubywaxx on their marketing each month. And that’s how I get my kicks – seeing a great business such as this grow and thrive. What kind of marketing work do I do for Rubywaxx? Marketing planning: We started with a comprehensive strategic marketing plan, but now we work from a simpler one-page marketing plan. Idea generation: part of the marketing planning process involves generating ideas. In the past this has included initiatives such as a loyalty scheme, and lots lots more besides. Marketing project management: Making sure that everything that needs to happens, happens – and on time. Website: I made the Rubywaxx website (a long time ago… I no longer make websites for clients) and have written all the content for it. The SEO website copywriting work I did means that the site receives a huge number of visitors – and the customer-focused copy converts these visitors into actual paying customers. Social media: Most of Rubywaxx’s Facebook Page updates are done in-house, but I add to this as needed to ensure that there are regular posts and updates. Marketing collateral: I’ve helped with (a) figuring out what marketing collateral is needed; (b) writing the content for that collateral; (c) sourcing photographs for the collateral; and (d) generating design ideas for the graphic designer to finesse. Working with a vibrant, growing business such as Rubywaxx is both fun and rewarding. Last night Rubywaxx was announced as being a Finalist in the prestigious Westpac Auckland Central Business Awards 2012, in the Excellence in Retail category. I’m thrilled and relieved at this: it was my idea they enter, and I wrote the entry submission. Neck on the chopping block, much?! Yes – but I know a good business when I see one. And it’s awesome to see Rubywaxx’s hard work rewarded in this way. The winner will be announced early November, but in my view, Rubywaxx is already a winner. Congratulations, Rubywaxx – you deserve this! PS. Are you an Auckland small business owner in need of some marketing magic? I currently have some openings available for new clients (but hurry, I take on client on a first-come, first-served basis, as that’s the fairest way to do these things. If that sounds interesting, the first step would be to have an initial consultation: full details and prices are here. Go on, your company could become an Award-worthy business too! 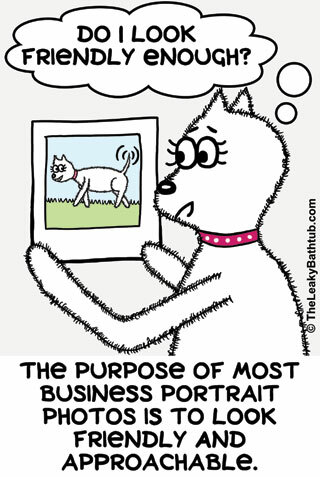 For many of us, having our business portrait taken is something that’s as excruciating as going to the dentist. More so, even, because the results will be displayed in public on a website and other marketing materials for all to see. So we drag ourselves in front of the camera; grimace as we smile; and hope that the result is usable. Chances are, the resulting image is far from ideal and makes us cringe every time we see it! Why is the resulting image likely to be disappointing? Because all too often your discomfort at being in front of the lens will have come through on camera. Your face might have smiled: but did the rest of your body? After all, when a prospect sees your business portrait online, they will make assumptions based on what’s in front of them. And that includes reading details into your body language. What’s that conveying? At the end of the day, the goal of a business portrait is to make you look friendly and approachable. 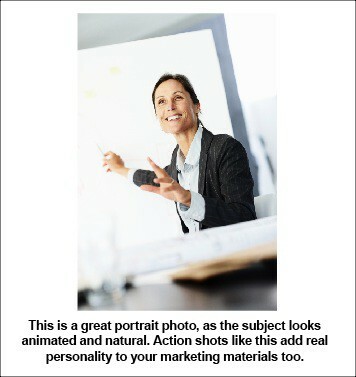 Is your business portrait doing that? Here are some of the body language factors you need to take into consideration when planning your business portrait session. 1. Should you smile with your mouth open – or with your mouth closed? Whether we smile with our mouths open or closed is something we often don’t stop to think about. Yet when your profile photograph is being used on marketing material, readers will observe a lot about you and your company based on your body language. And that body language includes smiling. So should you smile with your mouth open or closed? 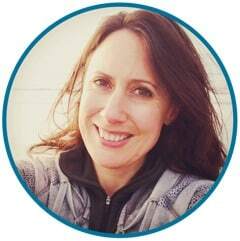 In most instances, it’s more appropriate to smile with your mouth open: after all, you’re putting your photo on your website to give your company a human face. And as you want people to contact you, it’s appropriate to look friendly and approachable. The only instance I can think of where a closed-mouth photo might be appropriate is for a fiction author who wants to be portrayed as mysterious and elusive. Other than that, I’d recommend a pleasant smile with teeth showing any time. If you’re concerned about your less-than-perfect teeth, that’s easy to fix up in photo editing software. So go ahead and smile for the camera! 2. Should you have your arms crossed or uncrossed? In many business portrait photos you’ll see the subject with their arms crossed… after all, arms are awkward things, as it can be hard to make them look natural in photographs. 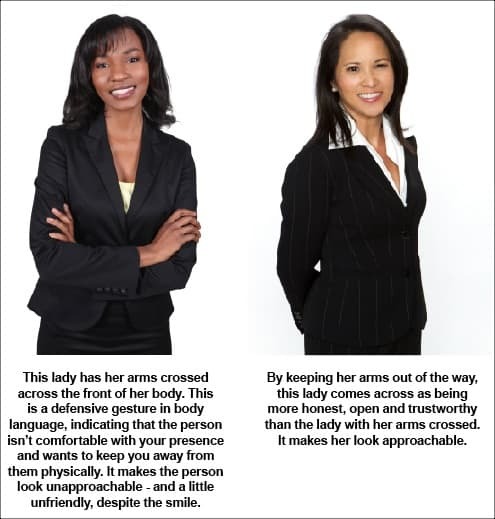 Crossing your arms can therefore be instinctive: but think about the body language that that’s communicating. Crossed arms mean you’re closing yourself away.It’s a defensive gesture. It makes the subject look uncomfortable; angry even. Look at these examples and judge for yourself. Both the models are in very similar poses; both have wide, toothy smiles; and both are similarly attired. The only difference is that one lady has her arms crossed, and the other one has her arms at her side. Which do you think looks more approachable? 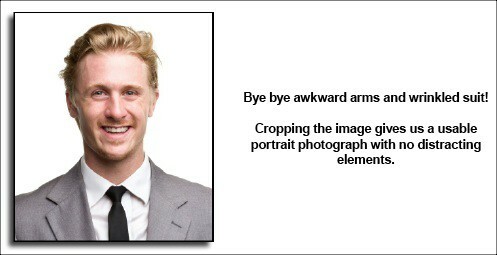 In short: avoid crossing your arms in your profile photo! So what should you do with your arms? In a whole body shot, it can be difficult to know what to do with your arms. We’ve already established that you shouldn’t cross your arms… so what should you do with them? Let’s look at some awkward looking arms first of all, so we know what not to do. Now we know that these arms look awkward in the photograph, we can figure out what to do about them. If you’re holding something, it can make your hands look a lot more natural, and make you look more relaxed. You’ve already seen the actions shot in the previous example, where the woman’s holding a pen. Even holding a pile of papers or a file can be helpful. Just be careful if you’re holding a piece of technology, such as a cellphone or computer. Technology design is evolving so rapidly, that such items will date a photograph very quickly! 3. Jacket on or jacket off? 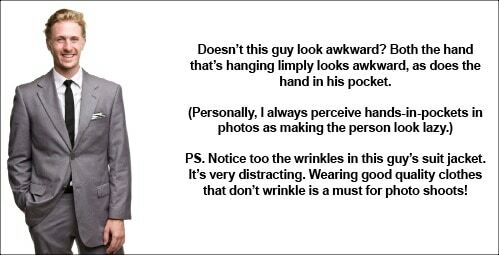 There’s no hard-and-fast rule about whether to wear a suit jacket or not in your portrait photo: you’ll need to decide for yourself if you want to come across as authoritative, or as being more approachable. In my photo shoot, I took two different outfits along. One of me in a suit, in shots where I wanted to look authoritative. But I also took along a plain black top, for the shots where I wanted to look as approachable as possible. 4. Where do you look? Do you want the Mona Lisa Effect or Non-Mona Lisa? Hint #1: not sure what the Mona Lisa Effect is? You can read all about it in the free eGuide I’ve written. 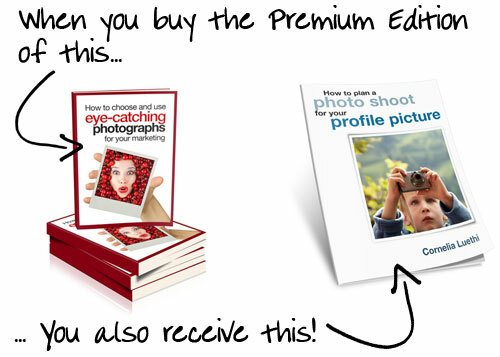 If you want your marketing photography to be successful, I strongly recommend you read the eGuide. Do you want your photographs to have the Mona Lisa Effect? Or Non-Mona Lisa Effect? Or both? If you can have both kinds of photos done, that’s a good idea, as it’ll give you plenty of flexibility in your marketing materials. By having both Mona Lisa Effect and Non-Mona Lisa photos, I can choose whichever is the most appropriate for the marketing piece I’m working on. I recommend that you do the same. By following these tips, not only will you have some great business portrait shots, but because you know what sort of outcome you want, you’ll feel more confident working with the photographer, too. Smile with your mouth open. Will your arms be in the shot? If so, keep your arms uncrossed – and find some way of making your arms look natural in the photograph, e.g. by holding something. Decide whether it’s appropriate to have your suit jacket on or off, or both. Decide whether you want your photos to have the Mona Lisa Effect, Non-Mona Lisa, or both. Do you need more tips on how to get cringe-free business portrait photos? How to choose a good portrait photographer. Body language issues to consider. Do you want to look friendly? Approachable? Authoritative? You need to think about this in advance. What to wear on the day of your photo shoot. Must-have makeup items for ladies (even if you don’t like makeup, you need these two items). How to make sure you’ll be happy with the final photos. 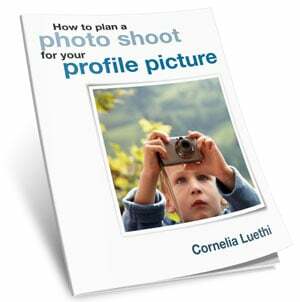 Where to use the profile photographs in your marketing. This eBook is available exclusively as a Premium Bonus with my eBook ‘How to Choose and Use Eye-Catching Photographs for your Marketing’. Stop being nervous about portrait photographs, and get a photo that you can be proud of! You’ve been told that networking meetings are a great way to get more referrals. And after much consideration, you’ve reluctantly agreed to give networking a try. Even though you’re just a teeeensy bit nervous about the whole thing. 1. Write your blurb in advance. Most networking meeting groups will give you a slot of 60 seconds or thereabouts for you to make your pitch to the group. Rather than risk fluffing your lines, write something in advance – and time it. 2. Smile! No matter how nervous you might be, smile! You’ll find that people will come up to you and chat. 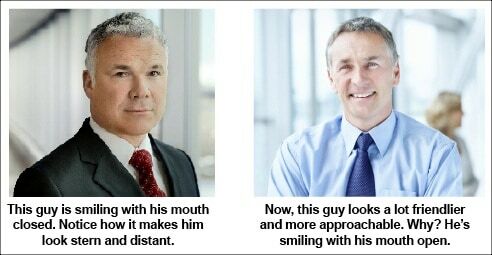 And it’s much more inviting for people to approach a smiley person, than one that’s looking grumpy or moody or terrified. 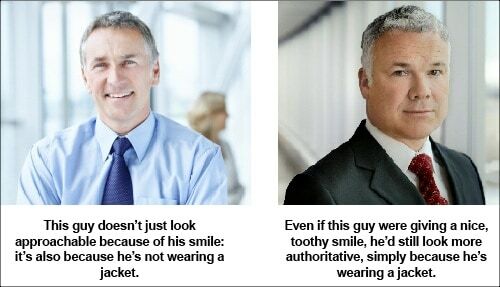 Besides, if you smile, you’ll probably begin to feel more confident too! 3. Introduce yourself. Don’t wait for other people to approach you; go up to them! Breaking the ice is easy; just ask what they do; who their clients are; where they’re based. Remember, everyone is here to talk business and to get to know more people. 4. Bring lots of business cards. Yes, bring a big stack of them with you. There might be a card folder or box for you to put the business cards into. Otherwise, don’t just hand them out willy-nilly – that’s the equivalent of spam. Instead, hand them out selectively to people you’ve talked to. 5. Follow up. Did you meet some interesting contacts? Follow them up and arrange to meet them over a coffee. Building relationships (and trust) takes time – certainly more than a 60 second sales pitch. If you’re prepared to put some extra effort into the networking outside of the meeting, you’ll see results far sooner. 6. Be patient. If you’re after instant results, networking meetings are the wrong tactic for you. Building enough trust to gain referrals takes time; people have to get to know you. It’s more about nurturing relationships, and helping other people; giving in order to gain. Armed with this knowledge, you’ll be all set to go… so remember to relax, enjoy… and smile! Remember those noisy kids at school – and how they got all their attention? They’d be up to all kinds of mischief trying to bait the teachers. And they certainly got noticed – by the other kids, the teachers, even the parents. Yet the attention they got was rarely for their schoolwork; it was far more likely to be about a prank they’d pulled! In the business world, the noisy people tend to get the attention. How good they are at their jobs (or not) we don’t know, but they’re certainly very good at talking themselves up, in a most convincing way. If you’re a quieter personality type, this can be annoying! After all, there you are working away hard – usually long hours. And making sure that you cross all the proverbial “t”s and dot all the “i”s. You know you do a good job – possibly better than anyone else out there – yet the noisy competitor is getting all the juicy contracts. How unfair! Doing a good job isn’t enough. You have to give yourself good publicity on the job you do. Because if you’re not going to blow your own trumpet, no one else is going to do it for you! The good news is that you don’t have to do this in a noisy, irritating way. It can even be low key self-promotion – which is fine, providing that you are promoting yourself. Feel a bit cheesy saying how great you are? Then get your customers to say it for you! Your best customers will probably be more than happy to give you a written testimonial, and that’s something you can use on your website, in your marketing materials, and even read out in networking meetings. Best of all, a customer testimonial is seen to be far more credible than you saying those things yourself. Launched a new website for a client? Revamped their brand? Installed a new IT system? Provided the project isn’t confidential, post details on your website, blog, Facebook, LinkedIn or Twitter profile. Your blurb doesn’t have to be long to get noticed! Making a good first impression at sales meetings is vital; if you’re not a natural sales person, it’s well worth getting some sales training. It can be a huge confidence booster. If you’re meeting a new prospect, showing them evidence of your work is a lot more compelling and convincing than just talking about it. So create a sales kit, which can include your portfolio, testimonials, profile document, and so on. Use your 60 second pitch to share a story of how you helped a customer – and if you have something visual to go with it, it’s even more compelling. By taking these steps, you’re not just raising your profile, but you’re also making it a lot easier for your contacts and strategic alliance partners to refer you to others. If you’re just walking the walk, very few people get to know about it. So talking it up helps spread the message. And as we’ve discovered, there are indeed low-key, non-cheesy ways to promote yourself. You don’t have to be as brash as the loud kid at school. 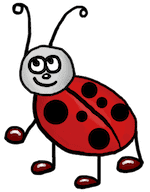 Gently does it – but just make sure you do give yourself some great publicity. Would you like a regular flow of new business, without having to much selling or prospecting? Of course you would! What business owner wouldn’t?! You’ve probably already tried networking and cold calling and advertising and a heap of other so-called “low effort” marketing, and the time or money spent hasn’t been worthwhile. Does that frustration sound familiar? If you’re nodding away reading this, then you should familiarise yourself with something else: strategic alliance partners. What’s a strategic alliance partner? A strategic alliance partner is a company operating in the same industry as you, and which has the same target market, but you don’t compete directly. Plumbers, electricians, builders, rental property managers. Graphic designers, web designers, marketing consultants, copywriters. Beauty salon, hairdresser, gym, personal trainer, makeup artist. … Notice how they complement each other, rather than compete directly? That’s what makes a good partnership. So why are these partnerships so important? These partnerships are important because the clients of one business probably need the services of a related business. (Maybe not all the time, but certainly some of the time.) So most suppliers are looking for other suppliers to recommend. Here’s the problem with referrals: when you suggest to your Best Ever Client that they should use a certain supplier, that infers that you recommend that supplier. And if that supplier does a good job, that reflects well on you. However, if the supplier does a terrible job, that will reflect poorly on you. The Best Ever Client will probably doubt your future judgement and referrals – and that’s not a comfortable feeling if you’re passionate about delivering great products or services. You want your clients to be well looked-after. That’s why having suppliers you can trust are absolute gold. Being in a similar industry isn’t enough; the companies that are working together need to have a similar ethos around customer service. That means it can take a little time and effort to find strategic alliance partners that are a good fit, but by crikey it’s worth it. Because if you get it right, you can expect to receive a regular flow of new business. So you’ve decided that strategic alliance partnerships are a good way to grow your business: congratulations! Now you have the big task of finding suitable companies to partner with: how do you do that? The first step in finding possible strategic alliance partners is to draw up a shortlist of industries. Remember, these partners should have the same target market as you, but without competing directly. The next step depends on how upfront you want to be in your approach. The direct approach: Consult a directory or list service to identify the names and contact details of companies fitting your profile for a strategic alliance. Then make contact with those businesses. The softly-softly approach: Network in places where people in those industries spend time. Or attend networking functions and events aimed at those industries. What are you going to say when you make contact? When you contact the possible strategic alliance partner, be clear with your intentions. Let them know why you’re approaching them; what you can offer; and what’s in it for them. Sometimes financial rewards can crop up in conversation; at other times, the organisations are just happy to have a relationship with a good quality supplier they can refer work to. How do you grow the relationship? Same target market: you may think you have the same target market – but do you? It’s best to double check than make assumptions. Goals: are you heading in the same direction, or do your goals converge? Rapport: feeling comfortable with the choice of partner is vital. Trust: developing trust takes time. Win-win: both parties have to gain something from the relationship, and both parties have to be prepared to put some time and effort into making it work. Communication: keeping in tough regularly is vital to the longevity of the partnership. Not all companies you identify as possible partnerships work out; that’s just the nature of the game. And sometimes those strategic alliances fade in and out. The important thing is that you persevere and are consistent (and persistent) in your approach. Do it well, and in time you should uncover a goldmine of qualified referrals to your business. You look up the address: you reckon you should be in the right place because your trusty map (or GPS unit) got you there… yet there is no street number marked on the building. You can’t find anywhere to park? All the spaces are either reserved, full, or threatening a tow-away… and every single on-street space is full too. So maybe you end up parking half a block away in a dodgy looking side-street and pray that your car (and its contents) will still be there later. You’re not sure which building is the right one? There are no signs or any other indication as to where you should be going. On closer inspection, you can’t even find an entrance door? So you then pluck up the courage to ask in another office, and the snotty receptionist gives you some half-baked directions which you don’t quite understand (probably because she’s just made them up). Eventually find where you’re meant to be, but are later than planned, hot, sweaty, in a bad mood, grumpy, etc? Just imagine how hard the sales staff will have to work just to get you feeling at ease and happy to be there. They’ll be starting on the back-foot right from the outset! Personally, my heart sinks when I visit a business like this. I figure they may as well go home, not bother. If they care that little about the customer, why should I spend my money with them? 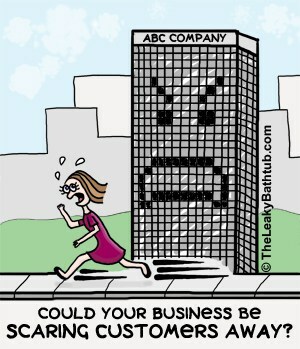 The business doesn’t seem friendly (nor customer-friendly) – so why should I do business with them? All your contact details – including the physical address. A map of your location. This is soooo easy using Google Maps – and free! Car parking details. If there are reserved spaces, mention where they are: and if you know full well that they’re nearly always taken, suggest where the best alternative parking spot is. If it’s pay-and-display, let your customers know if they’ll need cash or if they can pay with their cell phone or credit card. Better still, give them the coins or refund them their money. A photo of the outside of your building – this will help people to find your business. Any other directions or instructions that will help your clients. Invest in as much signage as is necessary – don’t be tempted to skimp. Make it easy and obvious for customers to find your business – and if you find they often go the wrong way, do something about it! Be proactive! In some cases, a simple self-printed and laminated page is better than nothing. Yet nothing is often all you see… that’s just lazy! Hint: if you do go for the DIY option, be sure to replace it regularly because paper does fade, get crumpled, rain-damaged etc. A dog-eared bit of paper is not a professional look. Oh, and if your address includes a street number, please please display that street number somewhere on your building or shop-front. Remember – there’s no such thing as making your business too easy to find! A stressed out customer won’t feel too get about spending money with an unfriendly business. Chances are you may not see them again, and the stories they’ll be telling their friends will be about what a nightmare they had finding your business, rather than raving about the excellent products or services on offer. Customer referral programmes: 7 steps to get yours cranking! Referrals are the lifeblood of most small businesses, and they are indeed a wonderful thing. What better than to have your customers doing your marketing for you! The problem is, that if this is left to chance, the process is very sporadic. Wouldn’t it be great if you could enjoy more referral business? The good news is that it’s totally possible to be enjoying more referral business! I’ve worked with numerous clients over the years to systemise their referral systems, and the good news it’s easy to do. However, there are definitely some ways of creating a referral system that work better than others. Here’s your 7-step guide to getting more referral business. 1. Give your customers a service so amazing that they say, “WOW”! First things first: you need to be giving consistently excellent service. No-one is going to recommend a business that gives terrible or lack-lustre service. So your business needs a good story behind it. Make it easy for your customers to tell your story and pass on your details. But let’s assume you do business face-to-face, and will be giving printed referral cards. The key here is to encourage your customer to keep them in their wallet, and that means three things. Firstly, the referral card has to fit in their wallet, so a business card-sized referral card is ideal. (Or at least something that folds down to business card size.) Don’t be tempted to do anything larger because it’s “prettier” – it’ll just get left on the desk… or in the bin. Trust me, the cards that work are business card-sized. End of story! Secondly, make sure the referral cards look good. Let a graphic designer work their magic. Personally, I’ll happily put a well-designed card into my wallet, but if it’s ugly and looks cheap, I won’t want to carry it in my purse, let alone give it to my friends. It would be too embarrassing to give them something cheap and ugly looking! If your card looks bad, it makes your business look bad. Good design is well worth the investment. Some businesses choose to offer a reward to incentivise referrals and speed up the word-of-mouth activity. It can be a good idea to reward (a) the referrer, and (b) the referree. Some schemes involve prize draws, so that only a select few win a reward. My feeling is that schemes that reward everyone will get a better uptake. People love instant gratification, rather than the possibility of a gift! Any rewards offered must be fabulous in the eyes of the recipient: enough for them to shout your story from the rooftops! It’s probably better to offer nothing at all, than something really dull or lacklustre. And remember, it’s all about perceived value, not the actual value of the item. Therefore value-added gifts of some kind work well; or contact your strategic partners for a relevant offer that’s beneficial for them, you, and your customers. It’s best to avoid offering discounts: all that does is erode your bottom line. And to be honest, discounts aren’t really all that exciting. 10% off; 20% off… yawn. But a free car valet? Or a bouquet of flowers? Yes please!! The other thing to consider is that the reward has to be easy and practical to implement. I’ve seen some referral schemes offer bottles of champagne, which is great if you have a local wine shop that can pick, pack and send all the orders for you. Otherwise you’ll have to be prepared to spend a lot of time buying the champagne; buying boxes for it; writing labels; organising couriers… you get the picture! So yes, make sure it’s practical to implement – no matter how busy you get. Here’s a sneaky tip: don’t offer one reward – offer two. But if you offer TWO rewards (e.g. champagne or a bouquet of flowers), the thought process is quite different. People don’t think “yes/no”, they think “which one”. For example: “hmmmm, I don’t really like champagne much, but I would like a nice bouquet of flowers to brighten up my desk. Yes, I’ll go for the flowers”. Don’t be tempted to offer more than two rewards, that just makes the decision too hard! Do send the rewards out promptly: a handwritten thank you card with it goes down a treat, too. Face-to-face: you and your team need to tell your customers about it. To make sure this happens consistently, write it in your sales scripts. Newsletters: this is a great way to publicise the scheme. Ideally, make it a regular slot in the newsletter, and announce how many goodies you’ve given away, or who the winner is. As well as reminding people that the scheme exists, it’s also proof that it’s “real” and that people out there are benefitting from it. Website: your website is another great medium to promote the scheme. Best way to do it is to dedicate a page to the referral scheme, telling people how they can sign up; how it works, and announce how many goodies you’ve given away. As with all marketing, measure the response you get. Try different offers and rewards too; if one thing doesn’t work, try something else. Your referral programme should be flexible and measurable so that you get the best results out of it. Perhaps survey some customers as to what they think of it: chances are you’ll get some great feedback. A referral scheme is a very effective way to welcome new customers to your business. It’s also very cost-effective: all it’ll cost you is the design, printing and rewards. And this is significantly cheaper than running advertising or direct mail campaigns. I sometimes have clients saying to me: “oh, the referral scheme isn’t working very well. We only get or so new 5 clients a month through it”. My response: Wow, 5 new new clients a month? That’s 60 new clients a year, and if they’re spending $200 each, that’s $12,000 of sales revenue… and the design and printing of the cards cost you less than $800! And if those clients come back year after year, that makes the whole exercise even more profitable! In terms of client acquisition cost, a referral scheme is hard to beat for small businesses. Especially if you follow the 7 steps above.